The Abiola Ajimobi-led Oyo State Government has sealed up a property belonging to Adebayo Alao-Akala, a former Governor of the State. Customers were also said to be locked inside the building. Alao-Akala had indicated interest in contesting for the governorship of Oyo State on the platform of the All Progressives Congress (APC) in the 2019 general election. However, a few hours to the governorship primary, he withdrew from the exercise, and also urged his supporters to "stay away". Although Alao-Akala had said there were plans to impose another aspirant, Joseph Olasunkanmi Tegbe, as the governorship candidate of the party, Bayo Adelabu eventually won the APC ticket. However, according to Akande, the property was locked up "under the guise of non-compliance with tax payment". The statement read: "Oyo State Government today, under the guise of non-compliance with tax payment, launched a disguised attack on the person and properties of His Excellency, Otunba Adebayo Alao-Akala. "At about 12.30pm this afternoon, staff of the Oyo Board of Internal Revenue stormed one of the Properties of Otunba Adebayo Alao-Akala located at No. 32, Oba Adebimpe Road, Dugbe, Ibadan with policemen and members of the Nigerian Civil Defence Corps and sealed up the property after presenting a letter from the Revenue Board giving one Mrs Oludewa the authority to seal the Property. 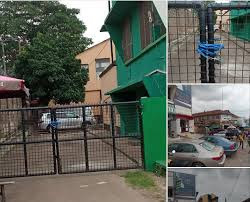 "The Business Complex popularly called Ile Itesiwaju and houses Business Concerns worth over Three Billion Naira is presently under lock and key and most of the shop owners and customers locked inside the complex. "The General Public is hereby put on Notice and all Lover and Supporters of His Excellency, Otunba Adebayo Alao-Akala are urged to remain peaceful, maintain calm and charged not to take laws into their hands as it is glaring, this action is Political motivated as 2019 is around the corner."